You know it’s going to be a good day when you find yourself singing the Davey Crockett song at 7am in Marana, AZ. It just doesn’t get any better than that. At the request of our revered President Mary Straus, DVG/PDG Randy Brooks introduced his guest, Mr. Al Anzaldua. And we were honored by a visit from Assistant Governor Jim Lamb. Our amazing foreign exchange student Matus Bogar gave a report on his experience at the RYLA camp last weekend. He thanked us for sponsoring him. Former RYLA counselor George Rigney had met Matus and friend Danny at the bus upon their return the previous night. Randy Brooks donated $173 to our Rotary Foundation from tips he received the previous Saturday night playing music at Café Tremolo. And Dan Contorno reported that 40 players had signed up for the upcoming Poker tournament – and there is still room for more. Mary will host an event with former DG Sally Montagne, who is coordinating a global grant for Children Peace in Africa. Our Club’s New Member Agreement was unveiled. Harold Burtzloff provided the original document and made some changes prior to it being approved by the Club’s Board. You can find it on this website. Jo Holt gave her Happy Buck this morning to National Squirrel Appreciation Day which is Thursday Jan 21 this year. Club members reacted in a diplomatically confused fashion. John Dooling (a.k.a. Davey Crockett) (don’t ask) wanted to know if anyone had ever tried squirrel gravy. Yum. Past President Maeve Johnson introduced our speaker, Ed Stolemaker, CEO of the Marana Chamber of Commerce. 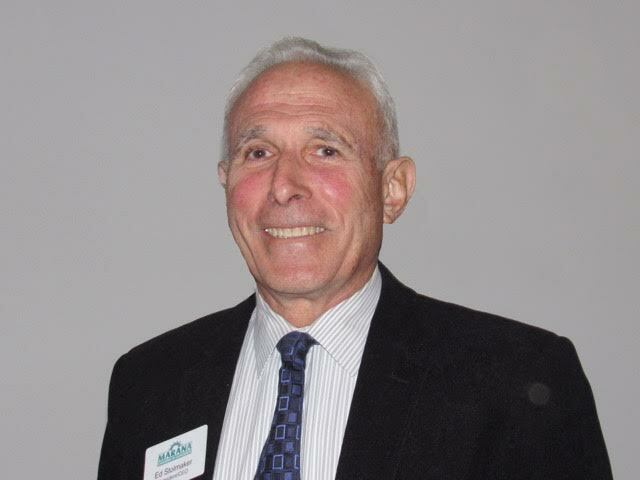 Among many other activities, Ed served on the board of the Marana Health Center for 13 years and was also chosen by this Club as the very first Marana Man of the Year. The Chamber has been the voice of business in Marana since 1987, and today represents 570 members and over 19,000 employees. Ed explained that the Chamber is fundamentally concerned with the quality of life in our community. A close partnership between the Chamber and the Town of Marana is key to this goal. Ed brought up the question of how the Chamber must change as businesses change, a challenge to all organizations. A tier dues system has been implemented which allows members to pay based on what they get out of the Chamber. There is a greater focus on online communication, such as through the website, than on the more time-intensive events. And the message from the Chamber? SHOP LOCAL! Sales tax dollars help strengthen the community. And Ed reminded us that the State of the Town address is scheduled for April 22nd.